Blondie Angel-looks Like A Mini Lab! Buddy: New Video! Personality Plus! He Will Keep You Smiling! Cici, A Tiny Min Pin/ig Mix Girl! Deuce, A Boxer Mix Puppy Boy! Emily Wolf Hound Look But Smaller In Size! Harley -i'm Looking For A Foster! Harry Is A Happy Boy! Jack Talbot "gentle Sweet, Loves Affection"
Jerry Kid Friendly Wonder Dog! John Ramsey, Happy And Playful Black Lab Mix Boy! Kenya-pending For Kristen, Christine, And Joslyn! Lavern's Puppies! 6 Girls Left! Lucas Is A Happy, Mellow Boy! Meet Mrs Pure Love "jayden"
Nelly & Ricky The Dynamic Duo! Scout! Social! Great Family Dog!!! A Lover! Sweet Pea Her Name Says It All! Sweetheart 75.00 Special ! ! ! Urgent! Valcore Needs A Home! 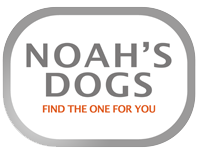 Share pictures and experiences of your dogs with the Noah's Dogs community. Passing on knowledge will promote responsible dog ownership and help dogs find their ideal owners and a loving home for life.